Keonna Green, who recently revealed that she is 22 weeks pregnant, spoke to Us Weekly about the mess and the fact that she really doesn’t feel too bad about the whole thing. Keonna details her history with Nick which began in 2002 when they were both in high school. The couple already had one son together when Nick began dating the Australian “rapper,” a relationship Green learned about via TMZ. It also seems that Nick had been cheating on Iggy with Keonna at least since September. Keonna adds that she didn’t really feel bad about their relationship because Nick was probably cheating on Iggy with other women also which, fair. It was last year, around September. We would take our son to Magic Mountain together. But sometimes Nick would say, “Oh, there’s too much traffic,” and he’d just play with Nicholas in his room. We got caught up in the moment and it just happened. I would be like, “Nick, you cannot be sloppy. You need to be honest [with Azalea].” He would say, “I don’t want to hear it.” I don’t know what was going on in his household, but me and Nick have lots of history. It wasn’t a secret on my end. I didn’t feel guilty because I was in love with a man, and I’m pretty sure I’m not the only woman. Keonna says she tried to reach out to Iggy but never got a response. Either way, again, she doesn’t feel too bad. No, I didn’t feel guilty. … I’m not the reason they separated. She found out what everyone else found out, according to what I’ve been told. Honestly I can’t blame her too much. Sure, she knew that Nick and Iggy were in a relationship, but at the end of the day, the onus lies with Nick not to cheat on his fiancé. 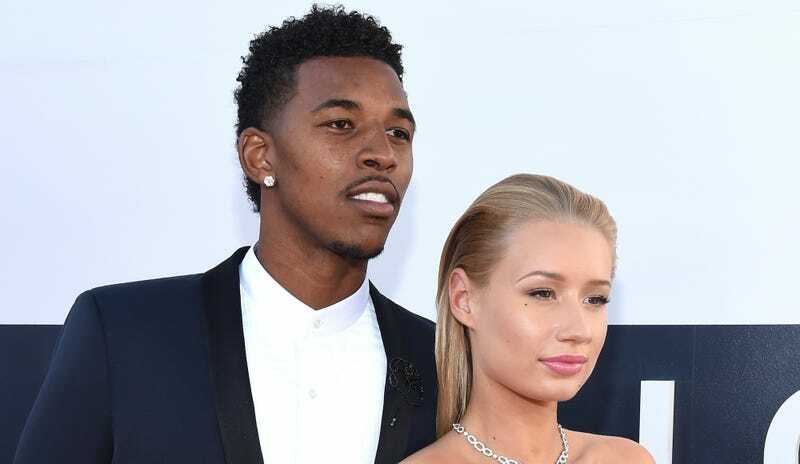 He’s the one who made a promise to Iggy, not Keonna. I mean, I’m definitely not going to apologize for being in love with a man who I have a lot of history with. I do wish her that kind of success and hope that she can get through this difficult time and she and Nick can move forward from this. For what it’s worth, Keonna adds that she and Nick are not currently together which seems like a smart move.